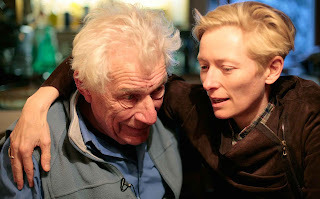 If you’re interested in seeing Tilda Swinton peel apples while the novelist, screenwriter and art critic John Berger discusses his father’s technique of peeling apples and if you’re interested how both of their fathers were not forthcoming about their wartime experiences you’ll want to rush out to see The Seasons in Quincy: Four Portraits of John Berger, currently playing at Film Forum. You'll also learn that both Swinton and Berger were born on Guy Fawkes Day. The film directed by Colin MacCabe, Christopher Roth, Bartek Dziadosz and Tilda Swinton is a tiresome hagiography of the writer who's perhaps best known for his book and TV series Ways of Seeing and the screenplay for The Salamander. The simple peasant existence Berger has lived for decades in the French alps is juxtaposed to the juggernaut of global capitalism, which the author animatedly and repeatedly condemns. It makes one cringe to see an otherwise inspired and complex writer like Ben Lerner, who appears in a segment of the film, looking with doe-eyed admiration at a figure whose nostalgic Marxist fiats are treated like scripture. Those who grew up holding Berger’s art criticism in high regard will be disappointed to hear him trumpeting Leger, a techno-cubist who’s a curious choice for someone for whom industrialized society is anathema. Archival footage of Jacques Derrida is employed in a section of the film dealing with animal consciousness and in support of Berger’s idea that mankind doesn't possess a superior apprehension of death to animals, despite humans' vaunted consciousness. The story of a pig’s demise is brought to bear in support of the author’s point. If you unconditionally love Berger and everything he says, then The Seasons in Quincy will be manna. If you regard yourself as a humanist who's vaguely indisposed to the excesses of materialism, but realizes that the Latin for utopia translates as “no place,” then you might be disinclined to worship at this Berger altar.